Young Michael raised his hand. But he put the thought of a priestly vocation on the backburner as he grew up. After attending Xaverian H.S. in Bay Ridge, he went to Pace University on a full scholarship. He studied literature and became the editor-in-chief of his college paper. Upon graduating college, felt a tug toward social work. He took jobs in the mental health, developmental disability and child welfare industries. He worked for Goodwill, LifeSpire and Catholic Charities Brooklyn and Queens, among others. He eventually enrolled part-time in college to pursue a master’s in social work and earned his degree in January of 2008. Father Panicali credits his passion for social work to his late mother, who had 11 children of her own and still found the time to care for others in the community. His mother would visit the sick and bring Communion to the homebound. When she would bring her kids to school, she would talk about who needed prayers and who was going through what at the moment. She also brought her kids to volunteer at CHiPS, the soup kitchen in Park Slope. But of all those who his mom helped along the way, it was MaryAnn who had the greatest impact on young Michael. When visiting their grandfather, the Panicalis would also stop in to visit with MaryAnn, a girl who was suffering from muscular dystrophy. The girl died when he was in his teens, but the future priest never forgot her. She helped fuel his passion to help others. During his time working for various social care agencies, he was also active in the St. Athanasius music ministry. He directed the choir and played the keyboard. He loved being part of the group that joined music to people’s prayers. He received positive feedback and thought this was his way of helping bring about God’s kingdom. Feeling fulfilled in his career and his music ministry, he still felt unsettled. God was still tugging at him. He had trouble understanding what more God wanted from him since He had shown him the fruits of his current labor. Thoughts of the seminary haunted him, but the change seemed too radical. He said his agony became so profound that in 2011 that he finally gave in. “Once I put in the application, I was at peace,” he said. He enrolled at the Immaculate Conception Seminary Residence in Douglaston. But just as he feared, the transition was not easy. He began his priestly formation alongside men half his age. He did not share the youthful vigor of his peers as they were beginning their adult lives. He was at a very different stage in his life than they. This made the decision of leaving behind his career and ministry – the things that gave him a sense of fulfillment – all the more painful. Nonetheless, he was determined to see the seminary through. Then-Father James Massa noticed his struggle and suggested he might want to transfer to the Pope St. John XXIII Seminary in Weston, Mass. The seminary specializes in later-in-life vocations. He was so happy during his time in Massachusetts, that he would wake up and ask God why he was receiving so many graces. Father Panicali said he now knows that God had to mold him into the person he needed to be, so that He could shower His Grace upon him. He is also happy to be back in his native Diocese of Brooklyn so he can follow the Mets. 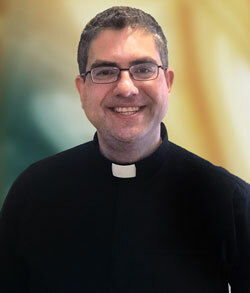 Father Panicali will celebrate his First Mass of thanksgiving at St. Athanasius Church on Sunday, June 4, at 11:30 a.m.
Father Michael inspires me to follow in Jesus’s footsteps. We have been childhood friends for more than 35 years, and he teaches me God loves every one of us with all of Our Lord’s love !! !